Over the past several months, we’ve made improvements to enhance the user experience when sending InformaCast broadcasts to IP phones and desktop computers. When trying to reach people within a building, these are the two devices most likely to grab someone’s attention, so it’s important that information is displayed in a way that is clear and cannot be ignored. In our latest InformaCast emergency notification system update, we’ve made additional improvements to help organizations create more eye-catching emergency notifications that help keep people safe and informed. In this blog post, we’ll outline the full details of this update and how organizations can begin implementing this new feature for enhanced notifications. Improved Icon Display on Phones and Desktop Notifier: Several enhancements were made to the display of icons added through the Icon field of a notification profile's Fusion Settings tab. Users can now add larger icon files which will display larger, especially on newer phones with bigger displays. Phones and Desktop Notifier instances previously had a required icon image size of 38x64 pixels. 100x100 is now recommended, although not required. In addition, icons will no longer be left justified or cropped on phones. Desktop Notifier instances also don't have cropped icons, but the justification remains left justified due to additional user customization options for the Notification window's size. This new feature comes on the heels of several enhancements for phone notifications and Desktop Notifier. Phone styling was recently added to provide more customization options for notifications. Organizations can now choose between three default notification styles (Normal, Warning, and Emergency), each of which can have customized background and text colors. Desktop Notifier now offers four different methods for displaying an emergency message. Organizations can choose from pop-up, ticker, tray or toast messages when sending an InformaCast alert. This allows organizations to choose the option that works best for them and gives them the ability to have multiple methods to choose from depending on the severity of the message. For any organization, the top priority should be keeping people safe. 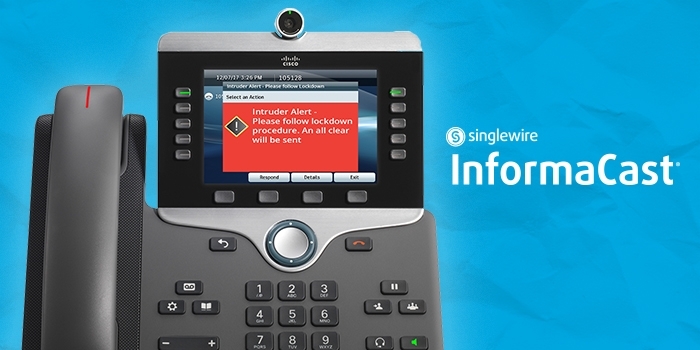 At Singlewire, we’re working every day to provide our customers with the features and abilities they need to do that through our InformaCast emergency notification software. These enhancements will help organizations send clear communications during a crisis event, saving time and reducing confusion.